I've never really worried about money. Not because I have a lot of it but because it's always taken care of for me. I'm not saying that proudly. I'm admitting that when it comes to money I'm horrible at it. Well, that's the story I like to tell myself anyway. When I started working I realised how hard it is to earn and save money especially when you're quite irresponsible with it. Luckily, I have a family who knows me all too well but I know, if I were to do it all on my own I would crumble soon enough. I don't like that about myself. However, the great thing about growing up is learning to harness your strengths and weaknesses because your survival depends on it. I've been meaning to deactivate my Facebook account for months but I keep coming across really useful stuff on it. Like this article on four money beliefs that are impacting your finances. 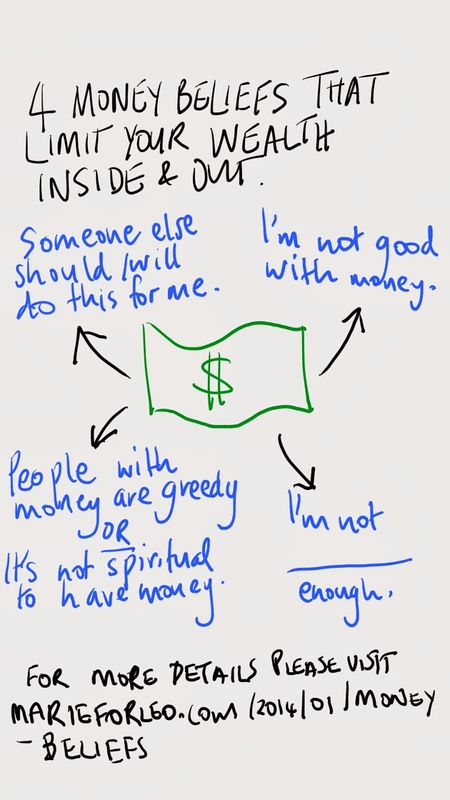 When I watched the video "Changing Your Money Beliefs" by Marie Forleo and Kate Northrup I just had to share it with you guys. I hope more people will do the same because there are way too many useless distractions on social media. Please watch the video and forward it to your friends and loved ones. It's time we take responsibility for our prosperity and help others along the way. As a Muslim, I was taught that we should always ask Allah (swt) for provision while working earnestly to obtain it. I once came across a saying along these lines: "I'm content with what Allah has given me because I don't know which (poverty or wealth) is better for me." However, we should not ask for or settle with scarcity but instead do our very best to earn Halal provision by seeking and creating opportunities to do so. For some people wealth might destroy them but for you, it could be a means to add value to your life and someone else's life for the sake of The One you love - Allah. The point is to do your best and leave the results to Him. Don't settle but be content and mindful with what He has given you so far and use it to take you further. I hope you're having a wonderful Sunday and that you'll have a positive week ahead of you!